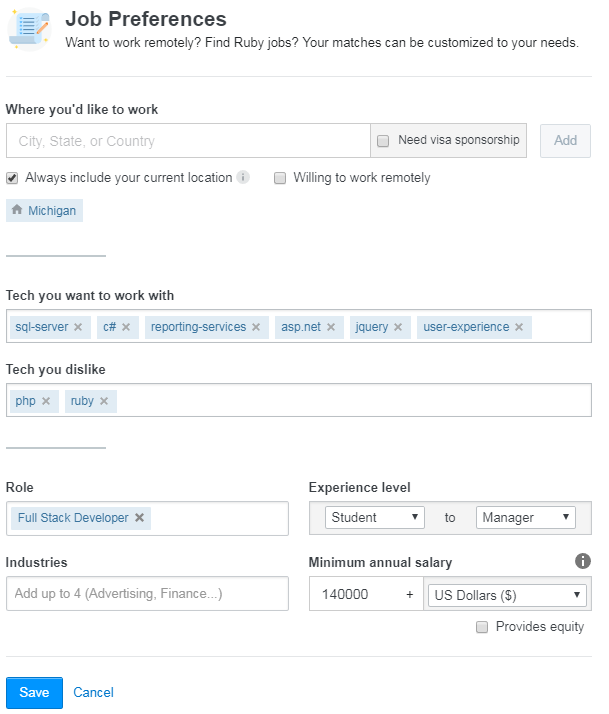 The jobs preferences page refreshes the background jobs that are displayed once you click the save button. The issue is they don't match my preferences. Also the "Need Visa Sponsorship" checkbox never gets saved when you check it. When one saves his / her preferences and the screen refreshes the jobs how come the matches don't really go into effect? Is there some sort of timing? I've tried to click "Need visa sponsorship" just to test and it does nothing. I also added tech I don't want to work with (I dislike) and I have "matches" set on the grid that shows me jobs yet I still get php / ruby jobs. there is caching involved but it's invalidated as soon as preferences are saved and propagated across the entire web tier using redis pub/sub so it's unlikely to be causing a problem. most of these preferences factor into a weight that is applied to a job which affects the sort order. Disliked tags effectively weight the jobs to be at the end of the search. I cloned your preferences and used some trickery to make it look like I'm coming from the same IP as you last logged in with and I see no php or ruby jobs in the list. Not the answer you're looking for? Browse other questions tagged bug status-norepro jobs .